I've got a lot of projects just waiting for their finishing touches, so I'm hoping to finish a few this upcoming weekend. We have a Public Holiday on Monday 2 June for Queen's Birthday weekend, so lots of time to sew. Top of the list is this quilt which I've almost finished hand quilting. 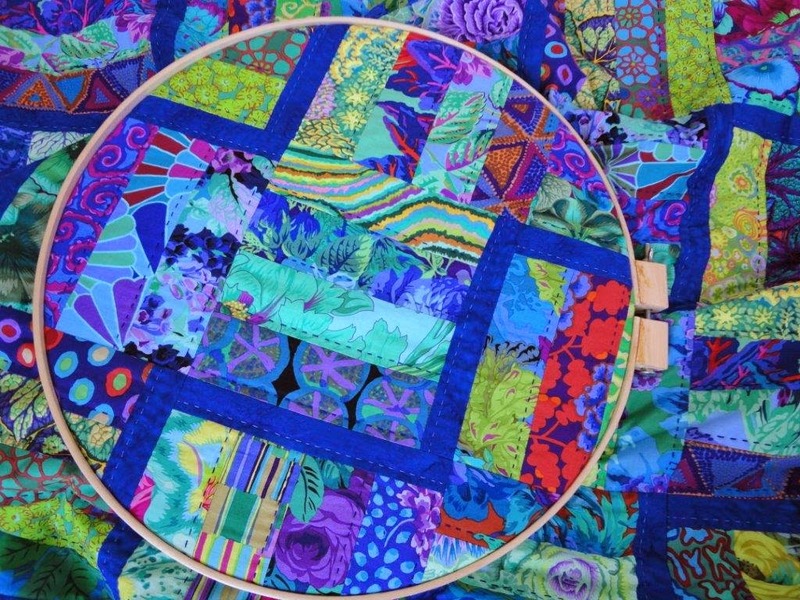 It's made from a Kaffe Fassett jellyroll in blues and greens. I'm hand quilting in two shades of blue Perle 8. I don't want to show anymore at the moment, but I hope to have finished photos to share next week. I"m linking up to Sew Cute Tuesday which is hosted by Ms Midge this week. I was thrilled when I visited her site this morning and saw that my black and white Tumbling Blocks quilt is one of her favourite picks from last week. What an honour. your black and white is awesome! love it. It looks like the one you have in your hoop is pretty nice too! Those are some gorgeous, eye-popping blues. Hope you will show a close up of your hand quilting when you are finished. I am really in awe of hand quilting - yours looks great and I look forward to your final reveal photos when it is complete! I love the fabrics in your quilt! It is so nice to finish a quilt so you can start a few more new projects! Nice hand quilting! You have a bank holiday for OUR queen's birthday? the Queen of England? How bizarre.. we don't! Love the colours and fabric choices Wendy. Will look forward to seeing more of this. Love the hand quilting! Can't wait to see more. Lovely colours! I'm envious of your hand stitching - I don't have the patience or the accuracy (maybe one day). Found via WIP Wednesday on Freshly Pieced. 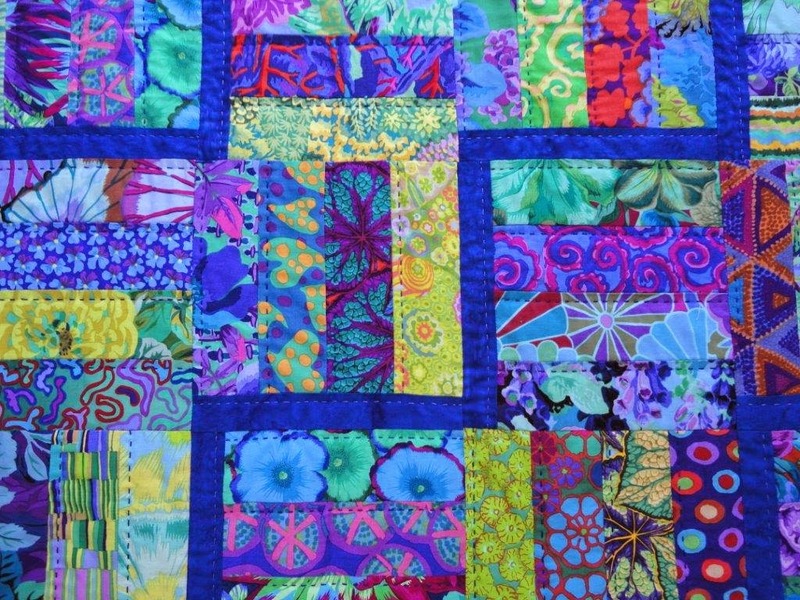 Your hand quilting is a wonderful way to finish this quilt. I'm guessing you live in WA? We don't celebrate Queen's birthday until the following weekend. Lovely job on your hand quilting Wendy! I love the colors in this quilt, can't wait to see it done! Would love for you to stop by tomorrow and link this up to Fabric Frenzy Friday! This is really stunningly beautiful! Hello and welcome to my blog. I learnt to sew at a young age and I've been sewing ever since. I enjoy both quilting and needlework, and will show you a bit of both on my blog. Thanks for visiting.